PIERCE COUNTY – The Correctional Peace Officers Foundation recently donated $500 to a Washington State Department of Corrections (DOC) community corrections officer to help pay for medical bills following an injury he sustained while on duty. Community Corrections Officers Zach Johnson and Darrin Patterson were completing field work on July 11 when they saw a man who was wanted on a Department of Corrections warrant. When they tried to arrest the man, he took off on foot, leading the officers through an apartment complex. During the pursuit, Johnson failed to clear a wooden stair platform and sustained a large cut on his scalp. Patterson immediately called for aid. Johnson was transported to a local hospital and underwent surgery to stop the bleeding and received several stitches to close the wound. Patterson made a full recovery. He released from the hospital and returned to work within two weeks. Community corrections officers from the Southeast Pierce County field unit joined members of the department's community response unit and apprehended the man on warrant status two days after the initial pursuit. On Aug. 29, the Correctional Peace Officers Foundation presented Johnson with a check for $500 to help with medical costs. Darren Feiler, a representative for the foundation who is also a DOC corrections specialist and instructor for the department's training and development unit, presented Johnson with the check. Feiler also visited with other community corrections officers and talked about the foundation's work to support correctional officers and their families. 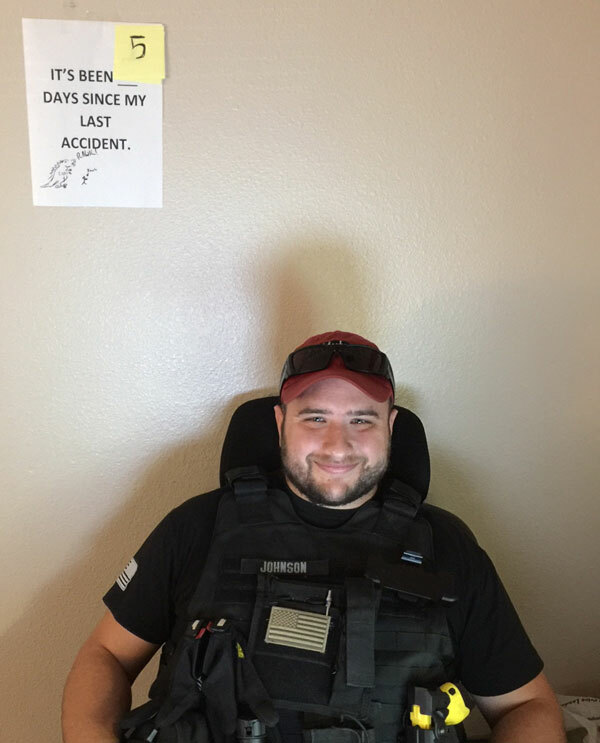 Community Corrections Officer Johnson was hired with the department in 2013 as a corrections officer at Washington Corrections Center in Shelton, Wash. A year later, he became a community corrections officer and worked out of the Chehalis, Wash. field office. He also worked out of Tacoma units one and two before transferring to the southeast Pierce County field unit in 2017. "Zach is kind and very laid back," said Randi Unfred, community corrections supervisor for the southeast Pierce County field unit. "He is eager to assist the team and never says no to a request for help. He is literally always positive. Even in the hospital, headed to surgery, the smile never left his face." Community Corrections Officer Patterson started his community corrections career at the west Seattle unit in 2013. He accepted a permanent position in Pierce County and transferred to the southeast Pierce County unit in 2015. "Darrin is driven and fiercely loyal to his team," Unfred said. "His fellow officers usually refer to him as 'the tech guy,' since he is very good at gathering information. During this incident, Darrin kept his wits about him to call for medical aid by radio and immediately performed first aid." The Correctional Peace Officers Foundation is a national non-profit organization. Founded in 1984, its mission is to operate and maintain a general fund for the perpetuation of the memory of those Correctional Peace Officers killed in the line of duty; to provide for their spouses, children or other beneficiaries; and to promote and project a positive image of the Corrections profession, both internally and to the general public.